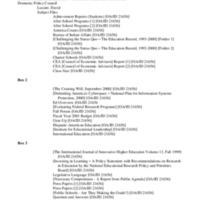 This collection consists of the records of David Lussier from his time in the Domestic Policy Council. Lussier was a White House Fellow in 2000 who worked with education issues relating to school violence, Hispanic education, after-school programs, teacher quality, and the fiscal year 2001 budget. David Lussier's records include fact sheets, press releases, articles, memoranda, reports, publications, emails, draft legislation, speech transcripts, and speech drafts.